The faith of St. Ann Catholic Church Parish has grown and strengthened through the zealous and devoted works of dedicated pastors and devoted parishioners. It stands as a beautiful symbol of unwavering credence of its members throughout these many years. Our Lady of Seven Dolors Catholic Church Parish of Raccourci, Louisiana, was established to serve the Catholic population in the northern part of Pointe Coupee. Even though at one time this area was a vibrant part of Pointe Coupee, transformation was imminent. From the French Capuchin missionaries who served the Louisiana colony to the original “Mother church” parish of St. Francis of Assisi of the post of Pointe Coupee, and beyond, the realization of change seems to remain the constant element throughout the ages. As the scope of these historic establishments widened and the course of the Mississippi River diverted, demographics of the area changed. The Catholic communities were faced with decisions that redirected “life” as they once knew it. In this area, Rev. F. Dominic Perino, the newly appointed pastor (1914), realized that change was essential. Raccourci became out of touch with the rest of the parish. It was by-passed by the railroad, abandoned by the river traffic, population was dwindling, and now could only be reached by the river road; furthermore, it was no longer the logical seat for the parish. After surveying the situation, his conclusion was that “a chapel in Morganza would promote the interests of religion in the Morganza-Fordoche, Grande Levee areas.” Thus, Father Perino, purchased land in Morganza and built a new small chapel (1915). By stipulation, the structure was dedicated St. Ann Church. On April 2, 1916, Father Perino celebrated the first Mass at St. Ann, planting the seeds of hope for the continual growth of this faith community. In 1916, Father Perino sold the property at Raccourci for $600, which he used to build the rectory in Morganza in 1917. Father Perino not only served the parishioners at St. Ann, but he also continued to celebrate Mass at Raccourci every other Sunday. Additionally, he served the Catholic community at Jacoby in a chapel belonging to Angelo Sparacino, which he later deeded to the parish in 1918. By 1919, the new church at Morganza became too small and Father Perino sought permission and means to enlarge it. In December 1919, he was authorized to proceed. The church at St. Ann was seriously damaged by a storm in June, 1934, with further damage by unusually heavy snow in 1935. It was necessary to build a new church; work began the next month and St. Ann began to take shape: a larger building with two towers, one at each side of the façade. It was blessed on Palm Sunday, April 14, 1935. After the tragic flood of 1927, the federal government planned to prevent further disaster by installing spillways to carry off flood waters. In the path of the spillway proposed was Raccourci. The parish was indemnified by the federal government, and the last Mass was offered on September 24, 1939. The Raccourci Church was dismantled in 1940; the materials were used to construct a parish hall adjoining St. Ann. The property was purchased from the Pointe Coupee Parish School Board in July, 1940 for $2,300. The hall was built and dedicated on October 20, 1940. Later, on July 14, 1949, a lot was purchased from Edward L. Hopkins and another from Dr. L.L. Innis at Innis, Louisiana. On March 15, 1954, part of the Innis Plantation was purchased for $10,000, on which was located an apiary (bee house) that was converted into a church. By 1956, renovations were necessary and completed at Innis, which concluded plans for the Chapel of St. Vincent de Paul. 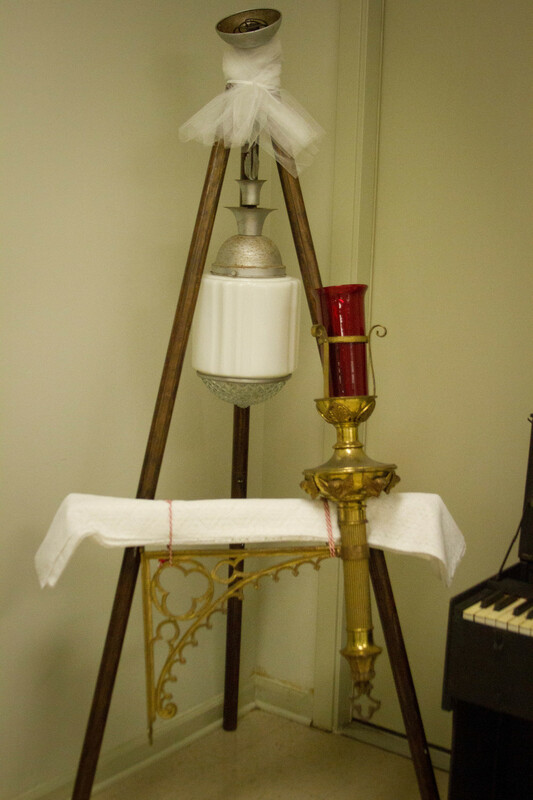 This mission chapel was formally dedicated on February 24, 1957. A parish hall was later built and used until the congregation became too large for the chapel to hold. Since the hall offered more space, it was changed into the new chapel, leaving the original church to serve as the hall thereafter. 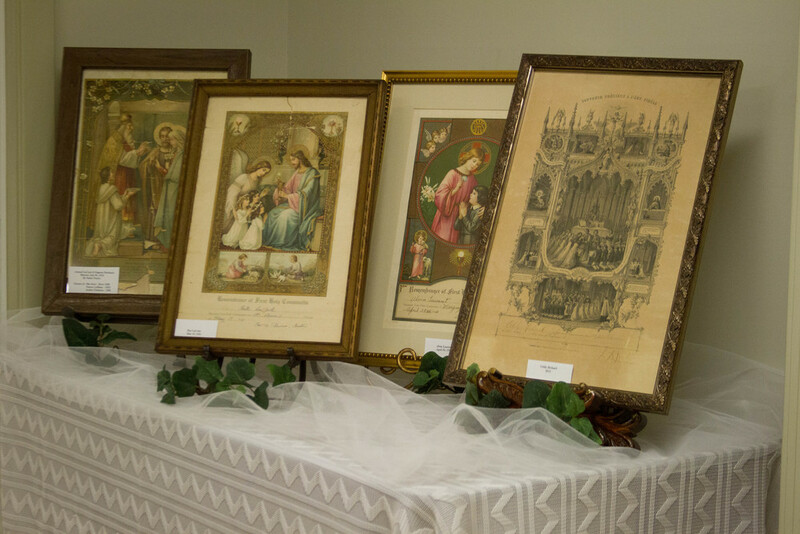 While the time of growth and life was increasing at St. Vincent's, the parish also saw it in the gift of religious vocations. In the summer of 1955, five girls from the parish graduated high school and left for New Orleans to become religious sisters in the Congregation of the Sisters of St. Joseph! What a tremendous blessing it was for them and for us. Wanda Bourgeois (Sister Stephanie), Barbara Hughes (Sister Teresita), Frances Landry (Sister Laura Ann), Myra Ramagos (Sister Ann Michelle), and Anita Tircuit (Sister Angela) each made their first vows in 1958 and have served the Church in many capacities over the years since they departed. The years that followed were difficult for St. Ann, as the created of the Diocese of Baton Rouge and various other circumstances brought about a steady stream of pastors through the doors of the rectory. For a stretch of 15 years, a new pastor came and went every two to three years. This was graciously ended with the appointment of Father Emmanuel Darmanin, who served the parish until his death in 1991. That time of stability in leadership greatly aided the parish in continuing to grow and strengthen in faith. With the death of Father Darmanin, Father Cleo Milano was appointed pastor and undertook the labor of renewing the parish facilities and reviving much of the life of the community. Fathers Louis Oubre, Howard Hall, and Keun-Soo Lee continued the mission of renewal with the formation of parish councils, ministry programs, maintenance of facilities, and a consistent focus on the gifts of the community. During this time there was another gift to the larger church in person of Jamin David. A native son, he entered the local seminary in the fall of 2000 and on May 31, 2008 was ordained a priest of the Diocese of Baton Rouge - our first priestly vocation! St. Ann Church Parish today, which includes St. Vincent de Paul Mission Chapel, is under the direction of Father Brent Maher, assigned as pastor in July 2014. St. Ann is still a very historical church, adorned with ornaments and furnishings from the Raccourci church, including chandeliers and statues which have been preserved and restored over the years. Beautiful new stained glass windows brighten the window niches depict the major events in the lives of Jesus Christ and the Blessed Virgin Mary. We even continue to enjoy the blessing of fostering vocations, as we are home to Baton Rouge seminarian Caleb Gilcrease, who entered in the fall of 2013. 100 years after being erected as a chapel, the beauty and simplicity of St. Ann Church still welcome all with open arms and draws visitors to our community. With much gratitude in our hearts, we ask that the Lord continue to bless us and all who come to visit. Good Saint Ann, pray for us! 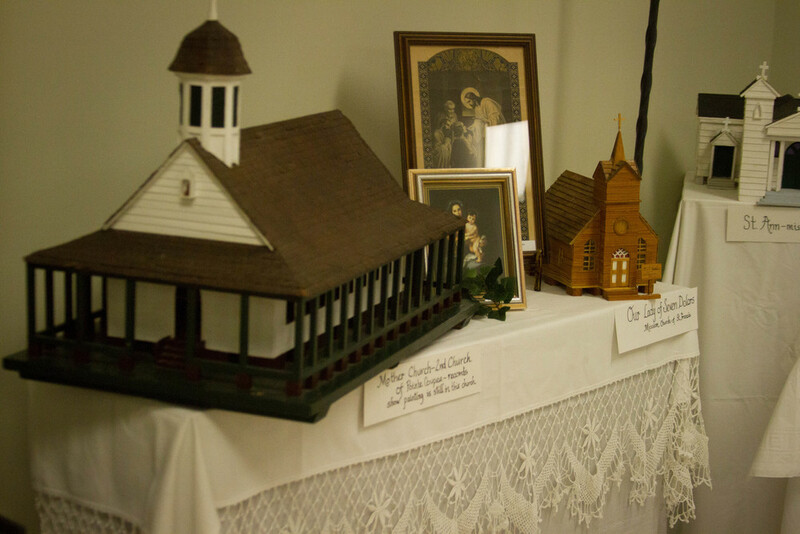 If you have historical pictures or artifacts of St. Ann or St. Vincent Mission Chapel that you would like to share, let us know!